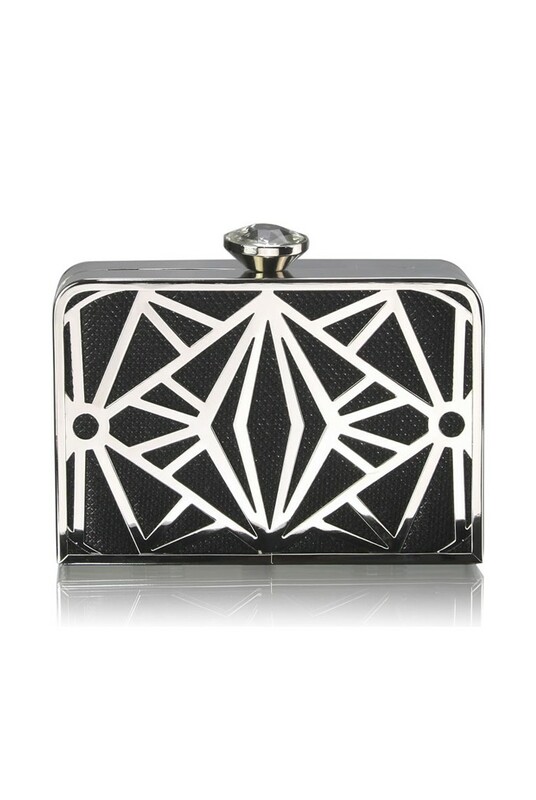 This is a rectangular Gatsby handbag in silver metal casing featuring triangle and diamond cut out detail set over a shimmering black fabric with a round push clasp set with glistening gem style stone. The bag measures 15 x 10cm and has a concealed silver chain strap for shoulder carry. - Rounded square shaped handbag in black. - Silver metal frame and criss cross, cut out geometric front. - Push clasp for zero fumble. - Detachable silver chain strap for shoulder bag option (allows maximum multi tasking). - Measures 11 x 4.6 cm. This is a rectangular clutch in silver metal featuring a criss cross of geometric shapes set on a red glitery fabric topped off with a circular push clasp holding a clear gemstone decoration. The bag measures 15 x 10cm and has a happy little chain inside so you can rock it like a shoulder bag too.